The impact of a droplet with a bath of an immiscible liquid is an interesting and complex phenomenon even for simple Newtonian liquids. 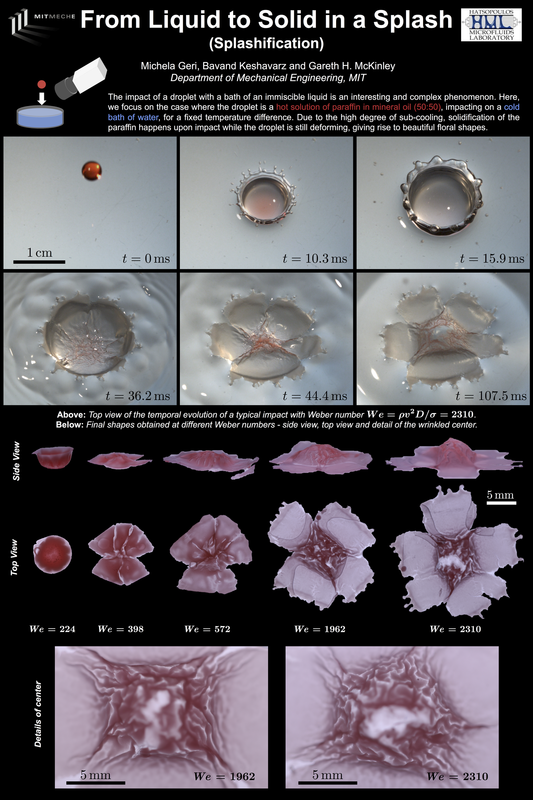 Different morphologies can emerge depending on the Weber number of the impacting droplet and the corresponding density difference with the bath liquid. In this work, we focus on the case where the droplet is a hot solution of paraffin in mineral oil, impacting on a cold bath of water. Due to the high degree of sub-cooling, solidification of the paraffin happens upon impact while the droplet is still deforming. Using high-speed imaging we show that the final shape of the impacting droplet depends on its Weber number, leading to unique patterns of solidified wax that change from a simple cup to floral shapes, with an increasing number of petals which grow in size with increasing impact velocity. Thermorheological changes in the wax mixture coupled with the involved hydrodynamic instabilities due to the impact govern the formation of these elegant patterns.